A recalculation of votes that political parties bagged in 2014 Lok Sabha elections shows the new Gathbandhan -- Samajwadi Party (SP), Bahujan Samajwadi Party (BSP) and Rashtriya Lok Dal (RLD) -- has the vote base to reduce BJP-Apna Dal (AD) combination to 36 seats in Uttar Pradesh (UP) from 73 it won in the last election. The regional parties can sweep up to 72 seats if they capture low margin seats won by BJP. However, they need the support of Congress for this sweep. The new combination can win 42 out of 80 seats in UP if they effectively transfer their votes for the Gathbandhan candidate. Congress can retain its two constituencies, Amethi and Rae Bareli. 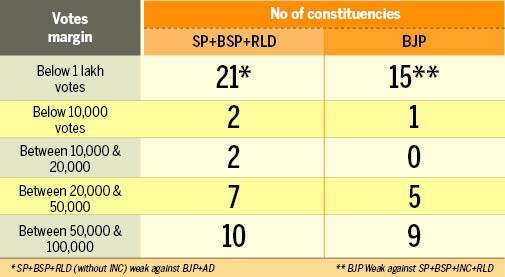 The interesting fact is that bringing Congress to the fold of SP-BSP-RLD itself will increase their tally of seats to 57, according to the new calculation. The SP and BSP have already announced that there will not be any tie-up with Congress except in Amethi and Rae Barel, where Gandhis are contesting. However, sources suggest that there will be some understanding at the constituencies. The Gathbandhan is weak in 21 of its possible 42 seats with less than 1 lakh vote margin and it can improve its position in at least 18 weak seats by including Congress. The BJP-AD is weak in 15 of its possible 36 seats with less than 1 lakh vote margin and Congress appears strong in 12 of these 15 seats. In short, Congress can increase the seats of Gathbandhan by 15 (including Amethi and Rae Bareli), strengthen their position in another 18 seats where the vote margin is less than 1 lakh. It will help them give BJP a tough fight in another 12 seats where ruling party has a lead. In total, Congress can influence 45 seats, going by calculations on 2014 numbers. The SP and BSP together got 3.46 crore votes in 2014, while BJP-AD was slightly ahead at 3.51 crore votes. The Gathbandhan's votes increased to 3.82 crore during the UP assembly election in 2017 (SP and BSP contested separately), while those of BJP-AD slightly reduced to 3.44 crore. BJP's number of votes rose sharply in the last assembly and Lok Sabha elections (from around 1 crore earlier to 3.4 crore). 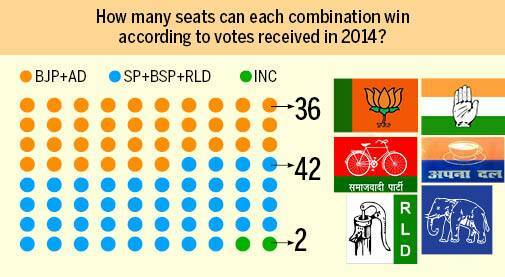 However, the votes of SP and BSP have not reduced at all. It indicates that both the regional parties will be able to transfer their loyal votes to the Gathbandhan candidate. 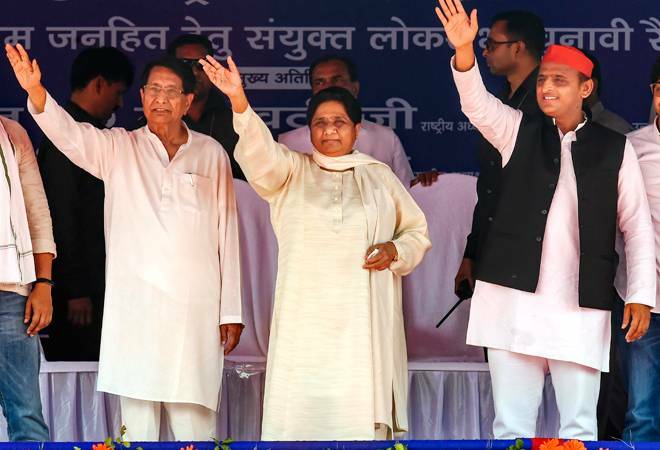 Surprising political pundits, the SP-BSP combine had captured the Gorakhpur, Phulpur and Kairana Lok Sabha constituencies in the by-election in 2018. In Gorakhpur, where Yogi Adityanath had won by a margin of 1,36,371 votes against the votes of SP and BSP together in 2014, the BJP lost by 21,881 votes in 2018. It means 1.58 lakh votes reversed in favour of Gathbandhan in the by-election. BJP was ahead by 33,708 votes in Kairana in 2014, according to the new calculation, but lost by 44,617 votes in 2018. In Phulpur, they were ahead by 1,44,598 votes, but lost by 59,460 votes four years later. Despite the calculation of votes, the influence of candidates in the constituency also matters in national election. While PM Narendra Modi and UP CM Yogi Adityanth spearhead the BJP campaign, Akhilesh Yadav and Mayawati are doing joint rallies in the state. Congress' campaign is led by Rahul and Priyanka Gandhi in the country's largest state by number of Lok Sabha constituencies.